Just last week, some screenshots of the look and a few features of the new Microsoft Windows 8 made their way to the web for everyone to see. Everyone is curious (yes, not just you techies!). What does it have to offer? Critics are divided. Not everyone liked the idea, although not everyone dismissed the new reinvention. But here at AllUSB, there’s this one feature that has us all hooked. 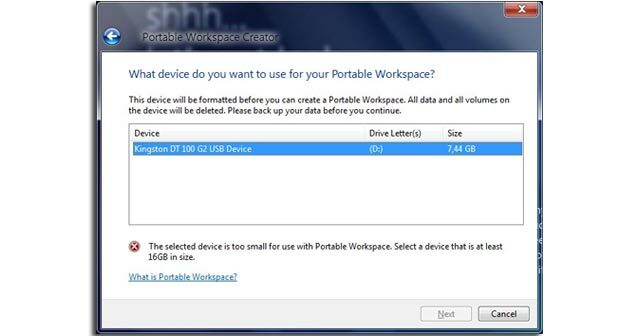 In a leaked screenshot, it looks like Win 8 has a feature named Portable Workspace. The name of the feature is a little self-explanatory. As it suggests, the feature allows users to have a copy of the full Windows 8 on a USB flash drive. In other words, users can conveniently run the bootable new OS, together with the desktop workspace, from their work PC or another computer. Whether it was inspired (or copied) from the Linux Knoppix OS or Puppy Linux, we’ll never know. As you may have expected, the USB portable app is large, so you should have at least 16GB of free USB space to be able to carry it around. But since you don’t really get the full 16GB when you have a new 16-gig USB, it’s advisable to buy one with an even bigger capacity. If booting Win 8 on a USB flash drive is fast or if it’s compatible with USB 3.0 remains to be seen. One thing we’re sure of, we can expect USB flash drive sales to jump with this new feature. We can also expect that manufacturers will strive to make the flash drives to go along with this app even better. With fingers crossed, we’re seeing USB technology rocking on as Win 8 invades enterprise PCs in the near future. Despite the setup screen specifying the use of a USB drive, this feature will work with other peripherals such as your eSATA or external hard drive. Once loaded, the Portable Workspace will remove the removable bit of your flash drive to make the USB appear as if it’s a fixed disk in your system. But we see another shadow coming. It looks like the new feature will only be seen on the Enterprise Edition of Windows 8. As you all know, Microsoft is crazy about making different editions for different groups of users. Whether it’s built for enterprise or for home use, there are still these questions haunting us such as: How many portable copies can you make? Is there an expiration date to the OS once in the flash drive? What’s more is that there are some even deeper questions concerning security. So why create a new OS? A video shown on technewsdaily courtesy of YouTube, shows the interface design of Win 8 looking very similar to that of Windows Phone 7. From the menu to the fonts, the new Windows is not much very much of a redesign. So if it wasn’t, why would Microsoft create a new one? What’s with the rush of creating a Windows 8 when Windows 7 users are still having fun? At this point, it’s really too early to say what’s going on and it may take a few more months to determine anything concrete. Aside from the Portable Workspace feature, we’d like to think we’re in for more surprises. If there’s one thing Microsoft is good at, it’s surprising us. Perhaps the Portable Workspace will wow us as a feature meant for both professional and personal uses. What’s your take on the USB flash drive Portable Workspace featured on Windows 8? This entry was posted in Articles, CES 2011, USB Flash Drives, Windows 8 USB App and tagged bootable flash drive OS, bootable Windows 8 OS, Custom USB Drive, new Windows operating system, portable USB app, Portable Workspace Creator, Portable Workspace USB App, USB app, Win8 screenshot, Windows 8 Portable Workspace USB App, Windows 8 USB app, Windows 8 USB flash Drive App, Windows 8 Workspace. Bookmark the permalink.